At breakfast at a Mumbai hotel a young man glances up when the World Cup is mentioned on television. I do too. Our common interest in the beautiful game is conspicuous in a country that largely shuns it. Football guy has an olive complexion, green eyes and expensively cut, slicked back, thick, glossy black hair. Muscular upper arms fill the sleeves of a freshly laundered, crisply pressed, blue T-shirt. ‘Italia’, it says, across the chest. ‘Do you think Italy are good enough to win it?’ I ask. ‘I ’ope so,’ he answers, with Mediterranean vowels. Appearances are most fun when surfaces are peeled away to reveal complexity. On his wrist I notice a steel bangle that looks more like armour than jewellery. Suspicions are confirmed the following morning when we start chatting. Yup: Italian Sikh. ’So where is home?’‘Dani’, 27-year-old Darshan Singh, grew up and lives near Milan. But he was born in Amritsar, and still has family there. He supplies fancy Indian hotels with Italian foodstuffs, imported specially. Dani travels on his Italian passport to India at least twice a year and to the UK at least once. He speaks Punjabi, Hindi, Italian and English. Supports Inter Milan. His wife is a Sikh born in Dudley, whose parents emigrated there from Punjab. The Black Country in-laws have now moved back, to the ancestral homeland, to retire. He’s certain his baby daughter will grow up speaking Punjabi and following the Sikh way of life, wherever in the world the family find themselves, however much it changes around them. He shows me a Sikh devotional app on his iPhone. It may not trip as easily off the tongue as British Sikh but ‘Italian Sikh’isn’t a particularly anomalous combination in today’s hyper-connected world. A little googling reveals that there are at least 70,000 Sikhs in Italy. It has the largest Sikh population in Europe outside the UK. Sikhs have settled in significant numbers on every continent – there are towns in Canada that are little Punjabs. In the UK one in every 150 of us is Sikh. In India, middle-class Sikhs typically now have family abroad. What was once a South Asian regional faith is now the fifth largest‘world religion’. Its adherents constitute a global community who commonly live across countries, disrupting our sense of the classic migrant story that involves leaving one country permanently behind to settle in another. While at home in Milan or Dudley, Dani’s extended family have never wholly left Punjab. They own houses and land there and return often for marriages, funerals, religious events, and in school holidays. It’s somehow surprising in India to encounter Sikhs who don’t speak English. They feel, to me, so British. A Sikh family used to run my local newsagents in East London. Returning from holidays or work trips, I always felt I was fully home once I’d gone in for a newspaper and said a few words about where I’d been, a debrief. One definition of community is ‘people who share stories’. The Singhs knew every story, every person, in the neighbourhood. They were the most visibly, locally anchored of local families, while still sharing stories with what Sikhs call the ‘Panth’, the worldwide community of followers. On a shelf above the counter there was a portrait of Guru Nanak. Have you ever been in to a gurdwara? You should. They’re welcoming places that are religious, obviously, but also have a strong household feel. The clatter of pans in a communal kitchen and dining area is as much a part of the atmosphere as the mesmeric devotional music. All who come, irrespective of background, are served, and eat together. Sikh communities who have made homes across the globe remember the homeland in endearing ways. Punjab means ‘land of five rivers’, so donations at gurdwaras are typically given in multiples of five rupees, pounds, dollars, euros, yen or roubles. On my travels I visit the Golden Temple in Amritsar, Dani’s town. It’s a hot, sunny day. The gorgeous cream marble scorches my bare feet. Following the example of others, I dip them in the cooling, crystal-clear body of water that surrounds the temple. If you want to hear all the accents of English, this, I realise, is a good place to come. Here a North American accent, there broad Glaswegian and, ah, two chatty Sikh children, a boy and a girl both around 9 or 10, who must be growing up, as I did, in Manchester. Sikhs everywhere carry Punjab in their hearts, but is there a place too in those hearts for all the places they have settled? 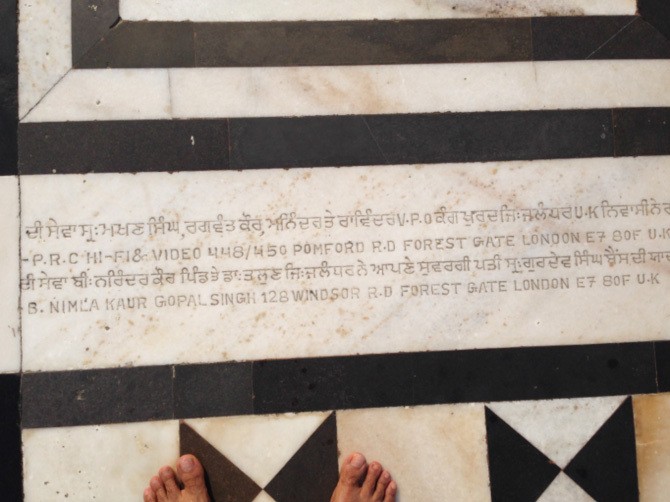 As I step back onto the marble, here at the heart of the Panth, I notice that a family of donors to the temple has had lovingly inscribed into the stone, on the path leading to the holy of holies, their names and, complete with full postcode, an address in East London.